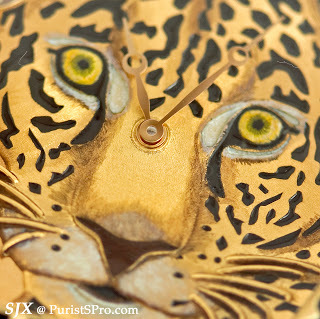 At SIHH 2011 Cartier unveiled several Metier d’Art watches, each of which demonstrated a particular artisan craft, including enamelling, marquetry and miniature mosaic. The Tortue XL with jaguar motif was one of my favourites of the fair. 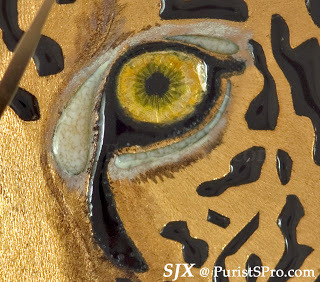 Not only is it visually striking, the Tortue jaguar demonstrates artisan craft and contains such incredible detail. This is not often found in watchmaking, which usually tends to leans towards technical skills rather than artisan skills. 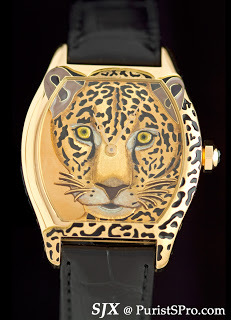 The jaguar – distinguished from the panther by its longer nose – is created by first hand engraving the gold dial before filling in the enamel. 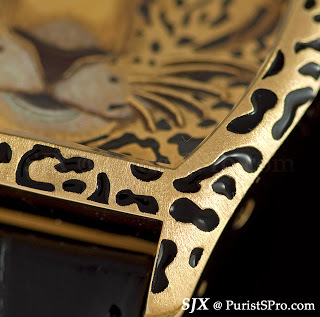 The incredible engraving work is most apparent in the fine fur of the animal. ﻿This video captures the process of creating the jaguar watch as explained by the craftsman behind it.